The local roofing market is becoming increasingly complex, but according to MiTek’s Uwe Schluter, licenced roof truss manufacturers across South Africa, together with state-of-the-art software programmes, provide high-quality, purpose-engineered truss units for any type of roof structure, from residential to commercial and extraordinary designs. “With special engineering input it is possible to create some very large and unusual roof structures with clear spans in excess of 40m,” he states. “However, after a clear span of about 17m, transportation can become challenging, which is when site-splicing becomes a good option. “In terms of design, prefabricated timber framed structures can be used in many different ways from formwork to seating stands and simply beautiful exposed structures,” he adds. As an addition to timber trusses, steel truss structures have also found a place in the market. Ideal for large span applications, prefabricated light gauge steel roof truss systems have many benefits, including a low mass of between 6kg and 10kg per square metre, which means that the load on the supporting structure is lighter and implies possible savings in transportation and erection costs. “Large sections of the roof can be pre-assembled on the ground and hoisted into position on the roof and since steel is non-combustible, it lowers the fire risk,” Schluter explains. Steel trusses can also be used in combination with timber trusses, presenting endless design options for unique roofs that suit a wide range of applications and different project requirements. 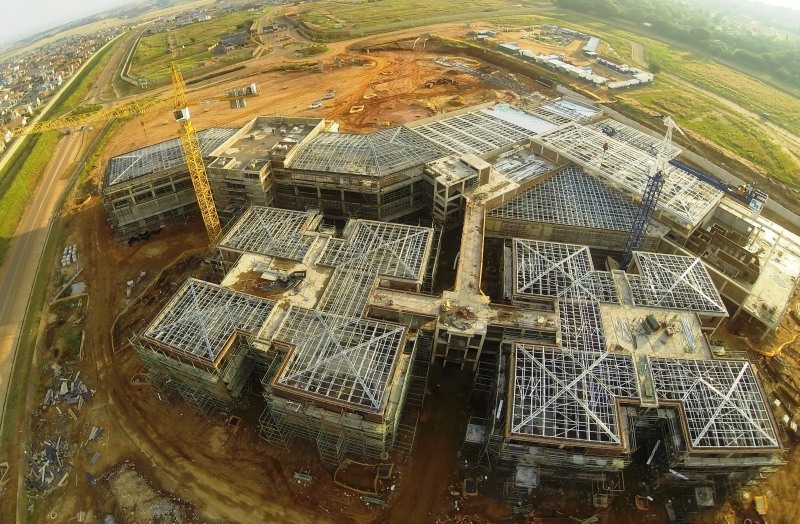 Mediclinic Midstream’s light gauge steel roof truss structure was chosen in order to reduce the total load on the supporting structure of the building. The 9 100m² prefabricated truss structure weighs almost 68 tons, just below 7,5kg/m², including purlins, which is extremely light considering some of the roof trusses span 19m with considerable live load and bottom cord loading requirements. Clusters of four large trusses were assembled onto braced roof sections on site and these big, prefabricated roof portions were then hoisted into position using tower cranes and connected together. Full thanks and acknowledgment are given to MiTek for the information given to write this article. A spectacular steel truss structure.